The full-back signs from Feyenoord and will fill the void left by Mathieu Debuchy’s departure for Arsenal. 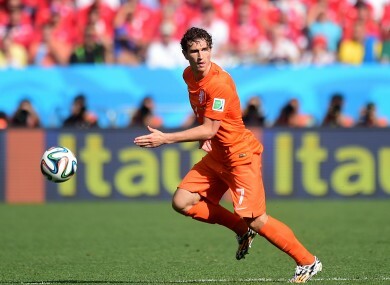 Janmaat featured in five World Cup games in Brazil. NEWCASTLE UNITED HAVE bolstered their defence with the signing of Daryl Janmaat from Feyenoord on a six-year contract. Right-back Janmaat moves to St James’ Park for an undisclosed fee after impressing as a regular in the Netherlands side, who finished third at the World Cup. And the former Heerenveen man caught the eye of Newcastle, who have made him the club’s sixth signing of the close-season following Ayoze Perez, Jack Colback, Siem de Jong, Remy Cabella and Emmanuel Riviere. Janmaat fills the void left by Mathieu Debuchy, whose transfer to Arsenal was also confirmed on Thursday. The 24-year-old told Newcastle’s official website: “Newcastle is a fantastic club, with a big history and a great stadium. I have also been told all about how great the fans are. “This is the perfect move for me, and I am really looking forward to being with the team and getting started here at Newcastle. “I think we are going to have a great season.” After moving to Feyenoord in 2012, Janmaat established himself as a mainstay at De Kuip and was a key part of the team that finished second in the Eredivisie last season. Janmaat went on to make five appearances at the World Cup as the Dutch topped Group B, thrashing holders Spain 5-1 in the process, before suffering a penalty-shootout defeat to Argentina in the semi-finals. Newcastle manager Alan Pardew added: “We are delighted to bring Daryl to the club. “He is the perfect example of a modern full-back; someone who is good defensively but offers a real threat going forward as well. Email “Magpies add Dutch World Cup defender Janmaat to their ranks ”. Feedback on “Magpies add Dutch World Cup defender Janmaat to their ranks ”.